The European Space Agency's Philae lander took this first panorama from the surface of Comet 67P/Churyumov–Gerasimenko after its historic landing on Nov. 12, 2014. The body of the lander is superimposed on the image. The first spacecraft ever to land on a comet has fallen silent, entering a potentially long, cold sleep after running out of power. The European Space Agency's Philae lander completed its last transmission Friday (Nov. 14) at 7:36 p.m. EST (0036 GMT) before settling into a hibernation state as its batteries ran out. The probe had been studying the surface of Comet 67P/Churyumov–Gerasimenko for 57 hours when it went to sleep, possibly for good. Philae landed on the comet on Wednesday (Nov. 12) as part of ESA's historic Rosetta mission. The washing machine-sized Philae lander unexpectedly bounced twice before landing on Comet 67P/C-G when the probe's anchor-like harpoon system failed to fire. Philae ended up in shadow near a cliff face on the head of the 2.5-mile-wide (4 kilometers) comet, which scientists say is shaped like giant rubber duck. All 10 instruments on the probe, including a drill to bite into the comet, performed their jobs during the probe's active phase, ESA officials said. "This machine performed magnificently under tough conditions, and we can be fully proud of the incredible scientific success Philae has delivered," Ulamec said in an ESA blog post. The Rosetta and Philae mission is aimed at studying what comets, which are thought to be the leftovers from the birth of the solar system, are made of. Locked in the ice on Comet 67P/C-G may be clues into how Earth got its water, and organic material for life, scientists have said. But even as Philae carried out its science measurements on Comet 67P/C-G, its days were numbered. The probe's solar panels never received enough sunlight to recharge its batteries, something that scientists hoped would extend Philae's life on the comet's surface. Comet 67P/C-G is tumbling in space, making one complete rotation every 12.4 hours. There is a chance that as the comet continues through the inner solar system, that Philae may wake up and phone home. The strange, alien landscape of Comet 67P/Churyumov–Gerasimenko is seen in detail in this photo from the European Space Agency's Rosetta spacecraft captured in late October 2014 ahead of the Nov. 12 landing of Rosetta's Philae lander. On Friday, before Philae's power ran out, ESA mission scientists commanded the lander to lift its body by about 1.6 inches (4 centimeters) and rotate its top by 35 degrees in the hope of moving its solar arrays into a more sun-favorable position. "We still hope that at a later stage of the mission, perhaps when we are nearer to the sun, that we might have enough solar illumination to wake up the lander and reestablish communication," Ulamec said. But despite that hope, ESA scientists are not holding their breath. Philae's mothership — the Rosetta spacecraft circling Comet 67P/C-G —is listening for a signal from Philae on the off chance the lander can still say hello. 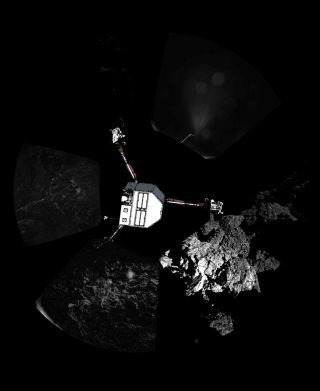 "The orbiter will listen for a signal, and will continue doing so each time its orbit brings it into line-of-sight visibility with Philae," ESA officials wrote in an update. "However, given the low recharge current coming from the solar panels at this time, it is unlikely that contact will be re-established with the lander in the near future." Rosetta is expected to continue its comet-chasing campaign through December 2015, ESA scientists have said.